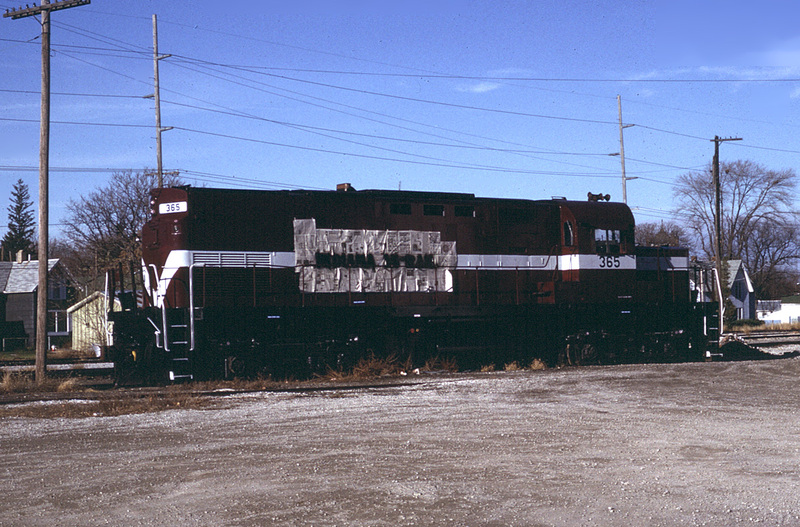 I started working for the Indiana Hi-Rail Corporation on October 1, 1989. I was hired to manage the agency office at Defiance, Ohio, but due to a delay in the transfer of the line from Norfolk Southern to IHRC, I was shuttled around a bit, spending some time at Connersville, IN (IHRC headquarters) and later in Evansville, IN. While at Connersville, I spent some time hanging around the locomotive shop, and was surprised to find out that IHRC president, R. Powell Felix, would personally apply the “Indiana Hi-Rail” lettering to locomotives that had received the company colors. Having done some equipment lettering myself, I spent one afternoon helping him do this on an EMD. 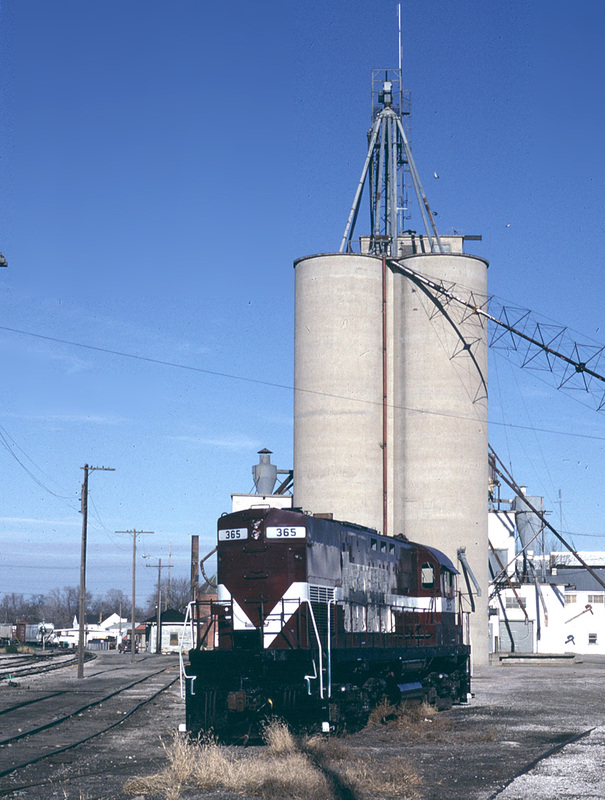 The IHRC was scheduled to start operations on the former-NS line from Woodburn, IN to Liberty Center, OH on 13 November 1989. 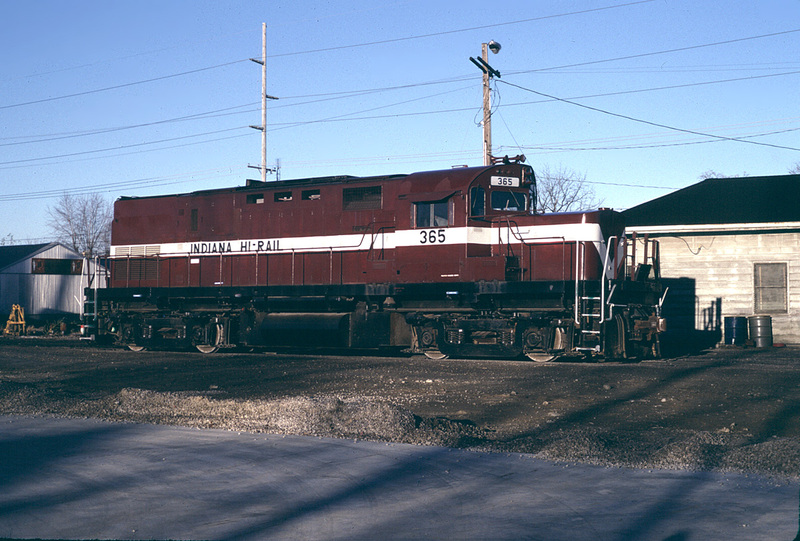 Alco C-420 #365 was given a quick paint job in the IHRC shops and sent north, and was on-hand in Defiance a few days before this. The painting was a rush job, and there had been time only to apply the cab numbers. I called Mr. Felix and asked him if he wanted me to get the lettering on the unit in time for the first run. He said yes, and sent his stencils up to Defiance by UPS. I spent the sunny Sunday of 12 November on #365, which was parked near the Defiance yard office, with stencils, newspaper, masking tape and some cans of gloss black spray paint. But somehow you found your way to Keokuk, and the rest is history! Ahh 365 I remember her well. She was my first ALCO when she came to Tiffin. I got many a cab ride from Engineer Steve Sadleclap. Unfortunatly she only ran in Tiffin for one short year. She was stored over the winter and was not drained properly and suffered freeze damage. The mechanics came and replaced a power assembly but the damage was too extensive and she was towed back to Indiana in disgrace. I never saw her again. I understand she soldiers on at the Cuyahoga Valley in Cleveland. Thanks for the story. I didn’t know what happened to her.